According to the research Food waste in Canada is very high as it is costing about $31 billion a year. 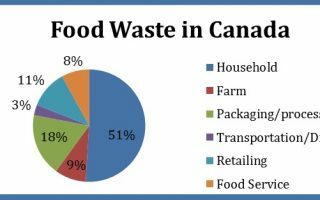 Canadian grocery stores have the food that people wastes and there is the huge impact of this waste food on the environmental and economic conditions of the country. However, Allison Vuchnich focused that there are worst wasters in the food supply system because of several reasons. There are lots of gaps in the food control programs according to experts, as they buy, not eat, and then throw out the barely credible amount of food (Vuchnich, 2015). Debra Lawson did the research that biggest source of waste of the food are households because there is the waste of 31 million pounds and it includes about 50 percent household waste. Moreover, professor name Sylvain Charlebois at the “University of Guelph’s Food Institute” said that in the national strategy there should be awareness and educational program at the schools level. Charlebois also said that Canadian is the nation that is wasting the most food in the supply chain. However, there are also waste across the supply chain that is done by the consumer but food waste needs to be noticed by changing some habits on the daily basis. Sylvain Charlebois recommend that how to safe food and do not waste it, as it is credible research that people buy more when they are hungry so not to buy things when one is hungry. One needs to be an inventory manager at home so its food could be managed and buy efficiently. For shopping, it is recommended that there is need to make a list before going shopping. There is the need to do shopping by keeping meals in mind. One should follow the list and should not go hungry. One needs to be an inventory manager at home so its food could be managed and buy efficiently. There is the need to check cupboards and refrigerator on the daily basis so that there could be notified of what is really needed. People should be creative and focus on purpose leftovers so there could be the better use of food (Vuchnich, 2015). One should donate the food to the food bank before the food is spoiled, one should donate it. There are agencies in the city. Santiago Holguin is the largest food rescue in Canada and it is collecting surplus fresh food so that it could be given to agencies and then to the people in need.